Drayton Manor Hotel Deals - Hotel location maps, prices, offers, star ratings and customer reviews. UK Motels - Premier Inns & Travelodges, cheap UK hotels, motels & inns with family rooms. 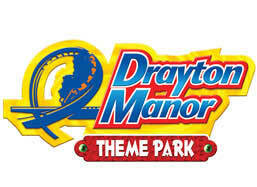 Drayton Manor Breaks - Hotel + Ticket Packages. Have a memorable break at the one and only Drayton Manor! Whether you fancy a day of thrill-rides and fun or a laid-back day out with the while family, Drayton Manor is ideal! The resort is home to amazing rides, attractions, a zoo, plenty of retail and dining options. A fab day out for the while family. Offers some thrilling rides and attractions to suit all daredevils. Home to the popular Thomas Land. Say hello to the animals at the on-site zoo. Plenty of exciting events throughout the year. Thrill Hopper Pass - The Thrill Hopper ticket allows one time entry to Alton Towers, Drayton Manor Park, Tamworth SnowDome and Waterworld. Drayton Manor Hotel (Tamworth Nr) Visiting Drayton Manor just got a whole lot easier with this fantastic and unique hotel built just 250 metres from the parks entrance. Located just outside Tamworth, and a mere 15 minutes from Birmingham, the hotel is incredibly easy to access and perfect for the whole family to stay in luxury after a long day of thrill-seeking, rollercoaster-riding fun. Each of the 150 guestrooms offer an incredibly comfy retreat for the whole family; guests can enjoy all of the comforts of home, with TV, Wi-Fi access, air conditioning and tea & coffee making facilities all included as standard. With two restaurants and four bars in-house, the Drayton Manor Hotel has an incredible range of dining options, perfect to suit any taste and appetite; for littler guests, breakfast meals come with a Thomas and Friends theme, as does the incredibly fun onsite playroom. Drayton Manor Park (Tamworth Nr) (2 Night Offer & 1st Night Dinner) Stay for 2 night's bed and breakfast and receive dinner on the first night of your stay. Dinner will be an allowance of GBP 20.00 per person. Holiday Inn Express Tamworth(Tamworth) The hotel is ideal for experiencing the thrills and spills of winter sports at the Tamworth Snowdome. Newly promoted Tamworth Football Club - The Lambs are just minutes walk from the hotel and Drayton Manor Family Theme park and Thomas Land are only a short drive away. The Holiday Inn Express Tamworth hotel is ideally located for both the business and leisure guest. All guestrooms offer High Speed Internet Access, complimentary continental breakfast, power showers and tea and coffee making facilities and children under 18 stay free when sharing parents room. The Hotel also offers 4 meeting rooms all with natural daylight and air-conditioning. The hotel is located adjacent to the Tamworth Snowdome, and with excellent motorway links, the National Exhibition Centre and Birmingham City Centre are only 20 minutes away. Holiday Inn Express (Lichfield) The well-connected Holiday Inn Express Lichfield is situated just 1 mile from the M6 Toll Road, 2 miles from the historic cathedral city of Lichfield, and a 30 minute car ride from Birmingham. Convenient for Alton Towers, Drayton Manor Park (Tamworth) and Birmingham NEC, Holiday Inn Express Lichfield is just 20 minutes from Birmingham International Airport. Complimentary parking spaces are available on site. Brook Marston Farm Hotel (Sutton Coldfield) The Brook Marston Farm Hotel is a restored 17th century farmhouse situated in 9 acres of beautiful countryside, just 1 mile from the Belfry Golf Complex and 9 miles from Birmingham NEC and Birmingham International Airport. The hotel is within 15 minutes' drive of Drayton Manor Theme Park and Tamworth Castle. LateRooms Drayton Manor - Discount late availability hotels near Drayton Manor - up to 50% off hotel rooms.